Transformers are a staple in my house of man and boys. If they even see an advertisment on the tv, we’ll be watching either the movie or the animated version. I’m so excited to have received Transformers Prime – One Shall Stand, featuring the 7 part story ARC. Spanning the first two seasons of the Emmy Award – Winning series. This summer, get ready for a special presentation of TRANSFORMERS PRIME for home entertainment. On July 31, 2012, Shout! 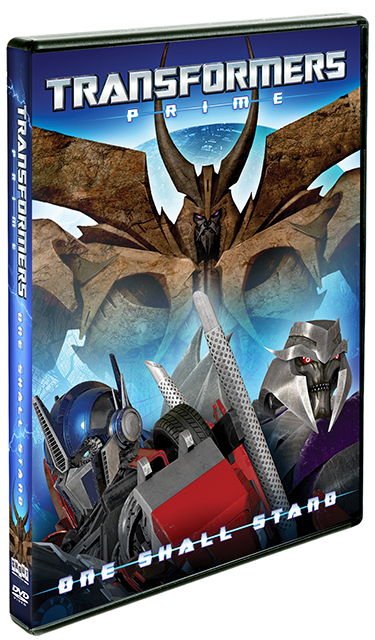 Factory, in collaboration with Hasbro Studios, will debut TRANSFORMERS PRIME – ONE SHALL STAND DVD, featuring the compelling story behind the most iconic AUTOBOT ever, OPTIMUS PRIME, and an epic tale of deception, sacrifice, loyalty and triumph. Produced by Hasbro Studios, ONE SHALL STAND highlights the story that spanned the first two seasons of the acclaimed CGI animated series TRANSFORMERS PRIME, which currently airs on The Hub television network in the U.S and Teletoons in Canada. This action-packed story arc is edited together in a seamless, riveting special presentation for this home entertainment release. Packed with exciting bonus content, TRANSFORMERS PRIME – ONE SHALL STAND DVD delivers spectacular CGI animation and captivating family entertainment for all ages. This highly collectible DVD is priced to own with a suggested retail price of $14.97. I received product for the purpose of this review. These opinions are mine and mine alone.